Experience San Francisco by bicycle! 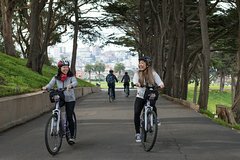 Start in fisherman wharf, just two block up of the begin of the bike path, ride in the totally flat Marina Boulevard and stop in the Palace of Fine Arts , and then enjoy the view from Crissy Field, and ride around of the Presidio National Park. Cross the Golden Gate Bridge, ride down to seaside town Sausalito, and cross the San Francisco Bay via ferry to return back to the city. From Sausalito you can ride to the nice and old fashion city of Tiburon and return back to San Francisco via ferry. these are a few things you can do with this rental, but it is completely self-guided. Also, if you are an advanced biker, you can ride to Muir Woods National Monument to see the tallest Reed Wood tree in the world.